Well, it’s October…which can only mean one thing. Fall Recipes! So, for the rest of this month and up until Turkey Day, I’ll be diving into as many Fall Recipes as possible. To me, Fall Recipes are when we start moving towards the warm comfort foods, but mostly dealing with apples, pecans, cranberries, cinnamon, caramel, gingerbread, and the big one…pumpkin. 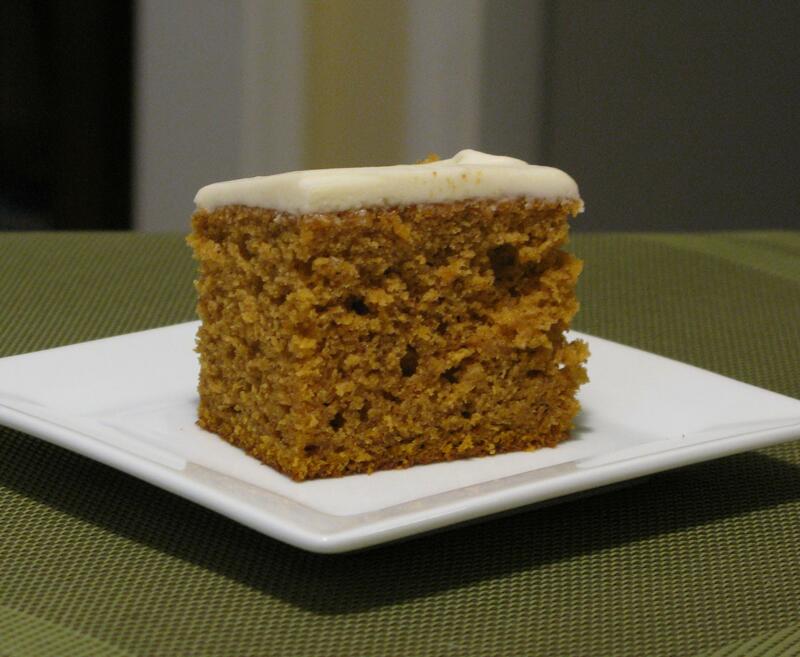 So, we’re starting out with some Pumpkin Bars this time around. As the fragrant flavors were swarming through the kitchen when these guys were baking in my oven, I couldn’t wait to get my hands on them. Luckily, I had some cream cheese icing left over from a hummingbird cake I made over the weekend to smother all over the top of them, which is exactly what I did. I cut two pieces for myself and my husband (he shared his with our daughter, since he literally just wolfed down two s’mores cookies), and the two of them polished their piece off…which our daughter started asking for more. As I was getting her ready for bed, my taste buds were screaming at me to get another piece. So, I got into a mental argument with myself over this. That stuff was so awesome, you know you want another piece. Don’t do it, you’re already full and you don’t need it! So, I made the courageous decision to get that stuff OUT of the kitchen this morning. Taking up space in the fridge is my excuse, and I’m sticking to it. But holy cow, these will DEFINITELY be made again. Amazing! Preheat oven to 350 degrees and grease a 9×13 inch baking dish. In a medium mixing bowl, add all ingredients and beat with electric mixer at medium speed for 2-3 minutes, until mixture is smooth. Pour batter into pan and bake for approximately 30 minutes, or until toothpick inserted comes out clean. Cool completely before topping with cream cheese icing. Store in refrigerator. In a small mixing bowl, beat the cream cheese, butter, and vanilla until smooth. Add powdered sugar, and continue mixing until smooth. Spread over top of cooled Pumpkin Bars.